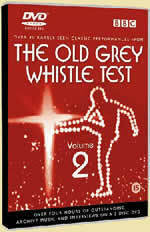 Old Grey Whistle Test DVD - Volume 2 will include Roxy Music's performance of Ladytron. Also included - newly filmed interviews with Presenter Bob Harris, founding nproducer Mike Appleton and musicians Roger Daltrey, Hamish Stuart, Roddy Frame, Rick Wakeman, Bill Nelson, Kevin Ayers, Bob Geldof, Nick Lowe, Robin Trower, Edwyn Collins and Jools Holland. The Old Grey Whistle Test was one of the UK's most influential live music shows. Launched in September 1971, it hosted performances from the world's foremost bands and performers including The Who, Roxy Music, Joan Armatrading, The Pet Shop Boys, Daryl Hall and John Oates, and many others. Following on from the enormous success of the first volume of The Old Grey Whistle Test on DVD, BBC Worldwide is releasing a second volume featuring more seminal performances spanning the entire series, from 'Head Hands & Feet' in 1971 through to 'The Pogues' in 1986. The DVD takes us through the 70's with the likes of Roxy Music, Kevin Ayers, The Who, Bruce Johnston, Joan Armatrading, The Adverts, and into the 80's with performances from Aztec Camera, Orchestral Manoeuvres in the Dark, Style Council, Suzanne Vega, Prefab Sprout and The Pet Shop Boys. The DVD includes original interviews with Kevin Ayers, Roger Daltrey, Nick Lowe, Rick Wakeman, Bill Nelson, T.V. Smith, Jools Holland and Roddy Frame. It also features newly filmed interviews with presenter Bob Harris, Roger Daltry, Hamish Stuart, Roddy Frame, Rick Wakeman, Bill Nelson, Kevin Ayers, Nick Lowe, Edwyn Collins, Jools Holland and founding producer Mike Appleton. Two of the shows original presenters, Mark Ellen and David Hepworth, recall some of the programmes finest moments on an audio commentary on the DVD. Throughout its seventeen-year run, The Old Grey Whistle Test pioneered live music television shows, unafraid of broadcasting some of the more raw, cutting edge performances and interviews and introducing the nation to new bands who were later to become world-famous music legends.